Stunning performance could lead to Camp Nou switch. Barcelona are contemplating a stunning bid for Celtic goalkeeper Fraser Forster after his brilliant performances in both of their UEFA Champions League clashes this season. 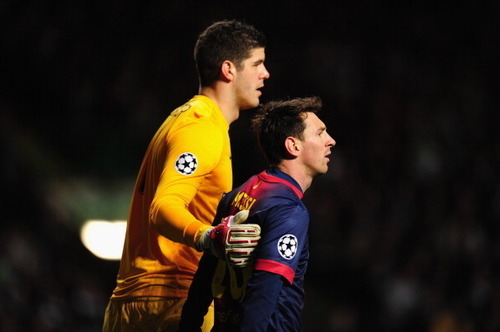 Despite Barca having 53 shots over the two matches, Forster conceded just three goals in total, and made a string of absolutely remarkable saves to keep the Bhoys in both games. Barcelona could not fail to have been impressed by his displays, and a move for the Hoops star would make a lot of sense. Current backup goalkeeper Jose Manuel Pinto is 36 years old, and with Forster 12 years younger and with huge potential, he would offer Victor Valdes more competition for his place. Forster has already helped Celtic break their record for clean sheets in a season, and could go on to become one of the best goalkeepers in world football. Will he do so at Celtic Park – or Camp Nou?